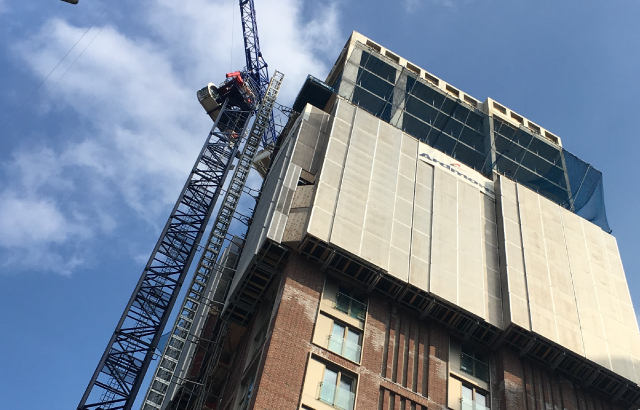 Stockwool’s 21 storey Aparthotel building in Aldgate is being built by Ardmore Group who have adopted an access shroud, rarely used in the UK. The shroud is a moveable enclosed platform that climbs up the building as the facade is built and provides unhindered access for a variety of trades simultaneously to undertake insulation, brickwork, metalwork and window installation. The shroud moves up the building using hydraulic lifting pumps and can climb two storeys in a couple of hours to a new location once work is complete. restrict access to one trade at a time and so do not deliver the time saving achieved by the shroud. The use of the shroud drives the programme with a production line approach as sequenced trades are brought to bear floor-by-floor according to the movement of the platform. Using traditional wet-laid bricks rather than pre-fabricated panellised construction has delivered a saving of nearly 50% of the cost facade and the shroud has enabled this traditional method to be delivered with much of the time saving expected of a pre-cast approach.